"Repeat after me: I. Hate. Sales." Sales is the bane of the freelancing life. Various polls conducted in freelance communities show that "finding new leads/customers/clients" is what freelancers self-identify as their biggest weakness and the area of self-employment that they struggle with the most. We see it as an intimidating and overwhelming prospect, with many of us considering “selling yourself” as a slimy, sleazy process. We have to go out to business events, hand out business cards, and brag about ourselves to complete strangers, right? Wrong. Well, you can do that, sure...or you can sell yourself in a way that really isn't salesy at all. The best way to sell is not to sell. Let that sink in. The best way to sell is not to sell. It sounds completely and utterly counterintuitive, but it's the truth. Hence the name of this audiobook: Anti-Sell. And in this audiobook, I'll tell you how and why it works and how to do it. 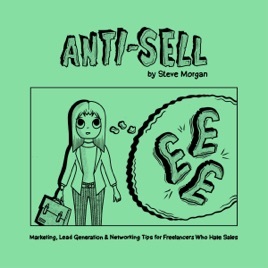 Also, throughout the audiobook, there’s “Anti-Sell Stories”: eight case studies contributed by real-life freelancers, each of whom details how they’ve fought the fight with sales (and won). This audiobook isn't narrated by a salesperson. I'm a freelancer, just like you. This audiobook runs through my story, my journey, and my tactics on how I've managed to win work without selling myself too much (or selling my soul too much, for that matter). So, if you're a freelancer who hates the idea of sales and selling yourself, then hopefully, this audiobook will serve you well.